A super tasty and super easy cheese appetizer! An extraordinary combination of spicy feta, crispy phyllo and sour-sweet honey sauce, that will amaze you! This feta cheese appetizer is a traditional mezes(starter), that originates from the island of Crete and is the perfect accompanying for some local drinks, like raki, rakomelo and tsikoudia. A phyllo-wrapped feta cheese appetizer that is very simple to make, yet very impressive to serve, perfect for a great start to your romantic dinner for two. To prepare this feta cheese appetizer, start by drying the feta with some kitchen paper. Use a knife to cut one phyllo sheet in the middle, and brush with olive oil. Place the 2 halves of phyllo, one over the other, and in the middle, place one block of feta cheese. Wrap the block of feta with the phyllo pastry into an envelope. Continue with the rest envelopes. Into a frying pan heat (high heat) some olive oil, so that when frying the wrapped feta cheese appetizer, it is half covered with oil. Fry the envelopes on both sides, until golden and crispy. Drain them on kitchen paper. Into a small pan, boil the honey, the red wine vinegar and water and stir. 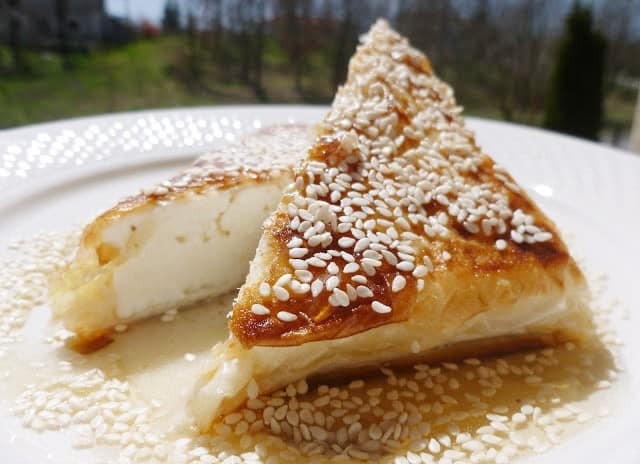 Drizzle the feta envelopes with the honey sauce and sprinkle with some sesame seeds. Serve while still hot and enjoy one of the most delicious traditional Greek feta cheese appetizer.